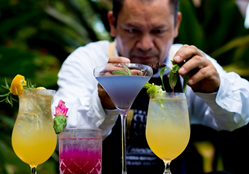 Beginning this month, Casa Velas in Puerto Vallarta goes garden to glass with a new interactive culinary experience. Guests can pluck fruit and herbs for their cocktails straight from the adults-only boutique hotel’s botanical garden. Beginning this month, Casa Velas in Puerto Vallarta goes garden to glass with a new interactive culinary experience. Guests can pluck fruit and herbs for their cocktails straight from the adults-only boutique hotel’s botanical garden. Perfect for creative beverage concoctions, the garden features rosemary, lavender, mint, basil, lemongrass, peppermint, epazote (Mexican tea), aloe vera, sage, nopales (cactus pads), thyme, tamarind, jackfruit, mango, guava and more. The resort’s mixologist will use the selected ingredients to make a personalized botanical cocktail to enjoy on the koi pond-dotted terrace. Varieties of fruits, herbs, vegetables and botanicals are also used in the cuisine and spa treatments at Casa Velas. If you can’t make it to Mexico this spring, Casa Velas shares its Jardin Mexicano cocktail to make at home. Peel the beet and slice thinly. Place in a glass with the mezcal to infuse. The beet will give the mezcal a special rose color. After 10 minutes, strain the mezcal into the shake. Add the remaining ingredients. Shake and serve. All-inclusive resort rates start at $268 per person per night based on double occupancy. At Casa Velas, luxury accommodations, gourmet meals, premium liquor and wine, 24-hour suite service, use of the fitness center facilities, WIFI, taxes, and gratuities are included in the nightly rate. For more information please call 1-888-407-4869 or visit https://www.hotelcasavelas.com. Casa Velas is a luxury all-inclusive boutique hotel and ocean club for adults only in Puerto Vallarta, reminiscent of a Spanish hacienda. The hotel features a private ocean club and is just minutes from the beach. Located just five minutes from Puerto Vallarta Airport and only 15 from the popular downtown area, art galleries and "El Malecon" (the boardwalk), the hotel features 80 spacious suites, some with private pools and Jacuzzis. Nestled on the greens of Marina Vallarta's 18-hole golf course, this Puerto Vallarta golf resort offers guests complimentary golf at three nearby signature-designed 18-hole courses. Its serene, exclusive setting provides an ideal backdrop for a Puerto Vallarta wedding ranging in size from 2 to 300. Lotus Spa at Casa Velas encompasses treatment rooms for singles and couples, a hydrotherapy area, garden-view fitness center equipped with state-of-the-art exercise equipment, and a beauty salon. A novel service is a handbag bar where guests can enjoy use of a "loaner" designer handbag at no extra charge. Emiliano, the AAA Four Diamond rated a la carte fine dining restaurant, is in the hands of one of the area's leading chefs serving Mexican and international cuisine. Guests can also enjoy dining privileges at the sister resort, Grand Velas Riviera Nayarit, with three gourmet specialty options. Forbes Travel Guide has awarded Casa Velas Four Stars, the only boutique hotel on the Mexican Pacific coast to receive. A member of SLH (Small Luxury Hotels of the World), it has been in the top five in TripAdvisor for Puerto Vallarta since 2010. Casa Velas is operated by Eduardo Vela Ruiz, founder and president of Velas Resorts, with brother Juan Vela, vice president of Velas Resorts, by his side. For more information please call 1-888-407-4869 or visit https://www.hotelcasavelas.com.